A Cowgirl Sweetie Costume including Dress, Vest, Scarf, Belt, and Hat – Ideal for any Cowboy, Wild West, or any fun fancy dress occasion! Saddle up little Cowgirl and enjoy your time on the ranch with this amazing Cowgirl Sweetie Costume. This costume comes complete with Dress, Vest, Scarf, Belt, and Hat. This knee-length dress features a Red and White gingham bodice, with puff sleeves and red lace trim, and a denim skirt with two red pocket detail, and white fringing to the hem. 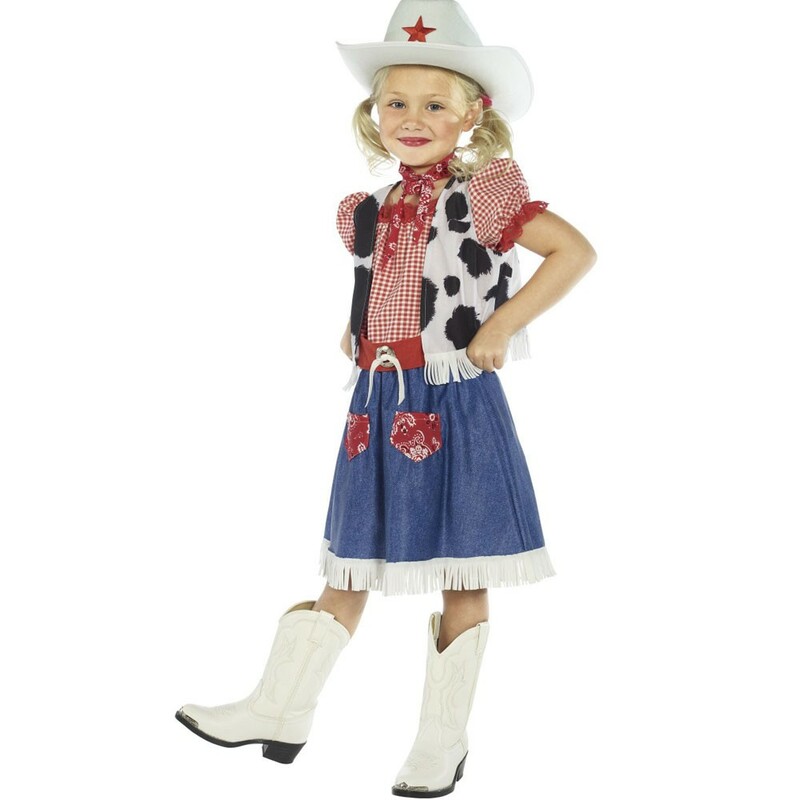 This Cowgirl Sweetie Costume also includes a Cow Print Vest with white fringing to the bottom. With a red belt, Red scarf necktie, and a White Cowboy Hat with Red Star detail, you’re all set to ride the ranch with style in this fantastic Cowgirl Sweetie Costume. A Cowgirl Sweetie Costume including Dress, Vest, Scarf, Belt, and Hat.